Sigh. No matter how many times I swear off Chanel nail polishes due to the arguably questionable quality/value ratio, they inevitably lure me back in with their new season colour offerings. 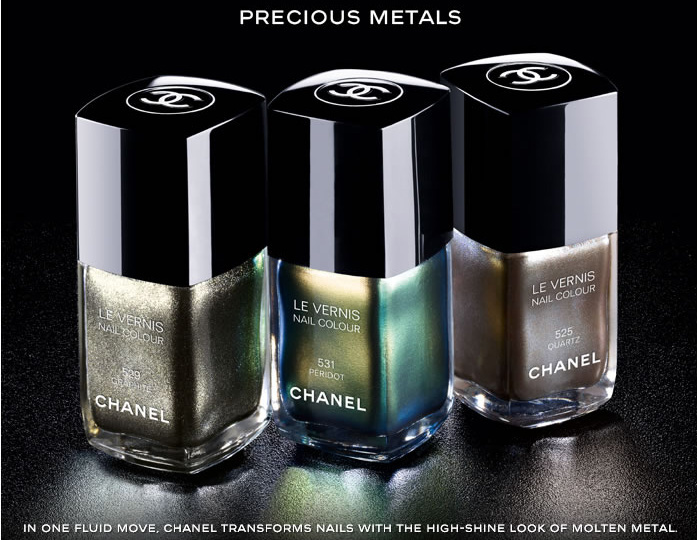 And the Fall 2011 collection is no different: I pretty much want every one of these gorgeous earthy metallics, available now from chanel.com. Pictured L-R are Graphite, Péridot and Quartz ... which one floats your boat? Quartz for me deffo, don't fancy peridot much but graphite also lovely! Graphite is my favourite. Would have to see Peridot close up before deciding but it looks very interesting indeed. Quartz just looks like a pearlised brown to me, a bit blah really. Gasp, a bit blah?! Roxy, wash your mouth out! I think all 3 of them are fabulous but as you say I would like to see Peridot close up before purchasing. Clodagh, probably in order of preference I'd pick Graphite, Quartz then Peridot but it would be very close. Karen, I have a serious Chanel polish addiction but if I'm honest I am often disappointed by how it applies and how quickly it chips. Peridot all the way - think I might be swimming against the tide of censensus here!